Wesam, a 21 year old college student at the University of Houston, and bonafide campus prankster, visited Washington DC on vacation with his friends and decided to crash a Georgetown Med school orientation. We spoke to him to get to know more about his pranks and how they got so popular. Why did you come to Georgetown to make this video? Me and my friends were on vacation. We went to DC and we were just exploring the city, and while we were walking we saw Georgetown was nearby, so we went ahead and just went to the campus. As we were exploring we found a classroom and we decided to go in and sit down. We had no idea what was going on but turns out it was orientation for incoming med students. They were just going around saying their name, where they came from, and an interesting fact about them. How did you come up with what you were going to say? Honestly, I don’t know. I just gave my phone to my friend, put it on snapchat and was like record this. Obviously when it came to me I wanted to say something random. Why did you start making videos? It’s just a hobby of mine since I was 11 years old. I would make random youtube videos and a lot of classmates would like it. That’s the main reason reason why. I just like posting my stuff there as a back up platform. When instagram and twitter started becoming hot, I started posting my videos on there because there’s a more active follower base. How do people react to your videos? Are they popular on campus? People typically think they’re funny and entertaining. I transferred to University of Houston in fall of 2016. I was at community college previously. When I transferred I thought to myself I want to dunk on people on campus. So, once I transferred I decided to buy a mini hoop with a ball and make an NBA in real life video. I was just messing around with my friends and dunking on people, and we made a video out of it. When I posted it on social media it blew up out of no where and all these pages reposted it like ESPN Houston, Bleacher report, Digital, Whistle Sports, and all these other pages. A lot of people on campus recognized me on campus because of that. They liked the attention it was getting, so I decided not to stop there and do NFL in real life, then WWE in real life, which was the most successful one, and NHL in real life. And all of them get reposted all over Facebook. How did you come up with the handles ‘papa wesam’ and ‘papa tube’? I started calling myself papa on my snapchat. It’s going to sound corny but I started working out last summer, and as a caption I would call myself ‘papa wesam’ and it started catching on and my friends started calling me papa. So I was like, alright, I can mess with this. I just went with it. What’s your favorite video that you’ve made? Definitely WWE in real life because there was definitely like no fucks given in that video. And that video blew up the most, and it was really fun to make. 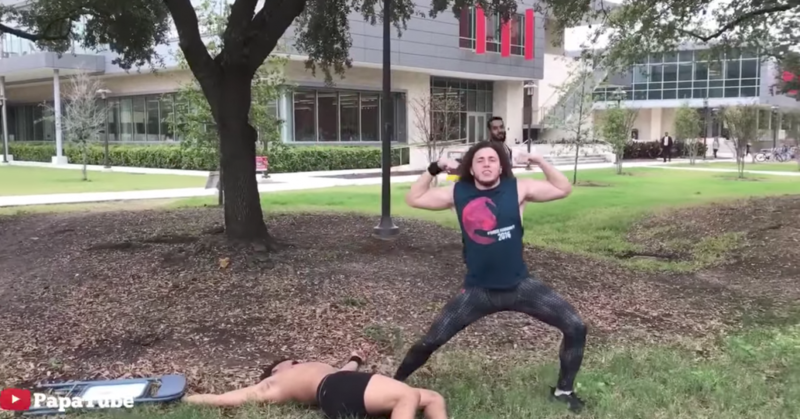 You just see a bunch of shirtless guys doing wrestling moves on each other and wrecking tables on each other, and that one got like 4.4 million views on ESPN Houston, and it got noticed by a couple of celebrities. How are you hoping to grow your following on youtube? What’s next for PapaTube? Honestly, I only post videos that I make on campus. Once the semester start again I have a couple of ideas in mind that I want to make, but for now on my instagram and twitter I’m just posting random videos and random skits. I do it for entertainment and I do it as a hobby with all my friends.